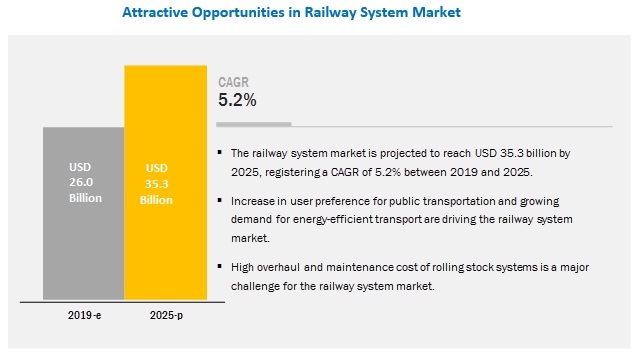 [139 Pages Report] The railway system market is estimated to be USD 26.0 billion in 2019 and projected to reach USD 35.3 billion by 2025, at a CAGR of 5.2%. Increase in user preference for public transportation is projected to drive the market. The rapid transit segment is expected to be the largest contributor to the railway system market, by transit type, during the forecast period. The current limitations of transport infrastructure in developed as well as developing economies have fueled the development for new and existing rail lines. Increasing traffic and growing population in urban areas have boosted the demand for ecofriendly transit options from commuters and governments. In metropolises, expansion of existing urban transit networks has generated demand for new vehicles which is fueling the demand for rapid transit. The vehicle fleet is larger in developed countries of Western Europe, while demand is expected to be higher in emerging economies such as China, Brazil, and India, where new infrastructure projects are being launched. These rapid transit vehicles are modern vehicles equipped with advanced safety and information systems. Moreover, majority of these transit vehicles have HVAC systems as well. Freight transportation is expected to be the fastest growing segment in the railway system market, by application, during the forecast period. The freight transportation segment is expected to be the fastest growing market during the forecast period. The main factors driving the market include globalization and rapid changes in the rolling stock manufacturing industry. Moreover, increasing cargo turnover between China and Europe is fueling the market. Train safety system is expected to be the second fastest growing market, by system type, during the forecast period. The train safety system is expected to be the second fastest growing segment of the railway system market during the forecast period. To achieve high levels of safety and security in rail, governments from different regions have introduced laws on improving the safety factors of railways which is driving the train safety system market. The key players in the market are CRRC (China), Bombardier (Canada), Alstom (France), ABB (Switzerland), Siemens (Germany), General Electric (US), Hyundai Rotem (South Korea), Mitsubishi Heavy Industries (Japan), and Toshiba (Japan). CRRC is anticipated to be a dominant player in the market. CRRC adopted the strategies of new product development, partnership, and mergers & acquisitions to retain its leading position in the market. The company strengthened its product portfolio and increased its global presence by building customer relationships. It has also increased its presence in emerging markets such as India. In February 2019, ABB received its largest traction equipment order in India, worth more than USD 42 million to supply state-of-the-art converters for electric locomotives from Diesel Locomotive Works (DLW), Varanasi. The converters are custom designed for Indian Railways and will be manufactured at one of ABB’s largest factories for locomotive applications in Nelamangala, near Bengaluru. In January 2019, Wabtec and GE Transportation merged, creating a global leader for rail equipment, services, and software. Wabtec Corporation entered into a definitive agreement to combine with GE Transportation, a unit of General Electric Company. This move by the company boosted its presence in more than 50 countries. In October 2018, Bombardier showcased the new MOVIA C30 metro train and energy-saving MITRAC TC1500 propulsion solution at the Persontrafik exhibition in Stockholm. Where will all the development in the field of railway systems take the railway industry in the mid- to long-term? How will the increasing adoption of high-speed trains and government safety norms impact the railway system market? What are the new application areas of railway systems? How will the advent of autonomous and connected trains impact the market? The study involves four main activities to estimate the current size of the railway system market. Exhaustive secondary research was done to collect information on the market such as the use of various systems in various applications and transit types. The next step was to validate these findings, assumptions, and market analysis with industry experts across value chains through primary research. A top-down approach was employed to estimate the complete market size of different segments considered in this study. The secondary sources referred to in this research study include railway industry organizations such as the Association of the European Rail Industry (UNIFE), American Railway Association (ARA); corporate filings (such as annual reports, investor presentations, and financial statements); and trade, business, and automotive associations. Secondary data has been collected and analyzed to arrive at the overall market size, which is further validated by multiple industry experts. Extensive primary research was conducted after acquiring an understanding of the scenario of the railway system market through secondary research. Several primary interviews were conducted with market experts from both, demand-side (in terms of component supply, country-level government associations, and trade associations) and supply-side (OEMs and component manufacturers) across 4 major regions, namely, North America, Europe, Asia Pacific, and the Rest of the World (RoW). Primary data was collected through questionnaires, emails, and telephonic interviews. In our canvassing of primaries, we strived to cover various departments within organizations, which included sales, operations, and administration, to provide a holistic viewpoint of the railway system market in our report. 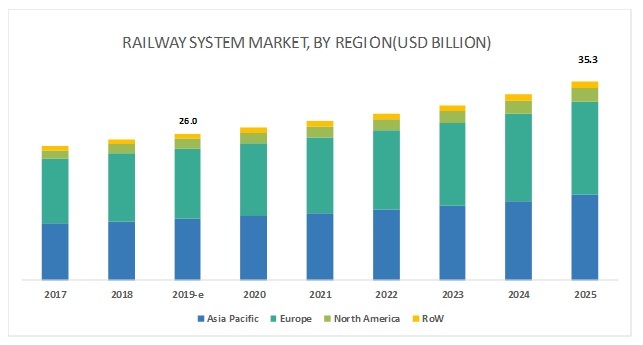 The Railway System market, by application, has been calculated using the top-down approach. Extensive secondary and primary researches have been carried out to understand the global market scenario for the applications of railway systems. Several primary interviews were conducted with key opinion leaders involved in the development of the market including OEMs and Tier I companies. Various qualitative aspects such as drivers, restraints, opportunities, and challenges influencing the growth of the market were taken into consideration while calculating and forecasting the size of the market. After arriving at the overall market size-using the market size estimation processes as explained above-the market was split into several segments and subsegments. All parameters that are said to affect the markets covered in this research study have been accounted for, viewed in extensive detail, and analyzed to obtain the final quantitative and qualitative data. This data has been consolidated, enhanced with detailed inputs and analysis from MarketsandMarkets, and presented in the report. The data was triangulated by studying various factors and trends in the demand and supply sides of the market. This research report categorizes the railway system market on the basis of application, transit type, system type, and region.